Friendship, Feelings and hopefully lots of fun! We hope you find those helpful. This year I want to focus on children in a different way; how they learn about their feelings, how they manage those feelings, and how they learn about being a friend. These skills are especially important once they join a group situation such as their preschool class. As adults we kind of take all of this for granted but young children are right in the thick of it as they try to figure it out. Children are born egocentric, meaning IT”S ALL ABOUT ME! Children have this innate need to meet their needs. It’s a survival thing. This learning is something we can provide. As we prepared for school this year our staff and preschool board had a lunch together. Our theme this year was “Our Story.” Molly Stucky decorated our tables with a stack of children’s books and other decor. They looked beautiful AND we found some new books we love! 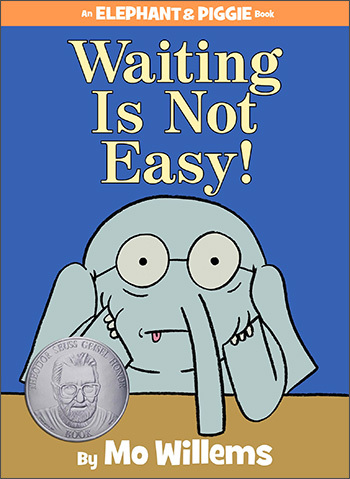 Many of you are probably already familiar with the Elephant and Piggie books that are written by Mo Willems. If not, you are in for a treat! 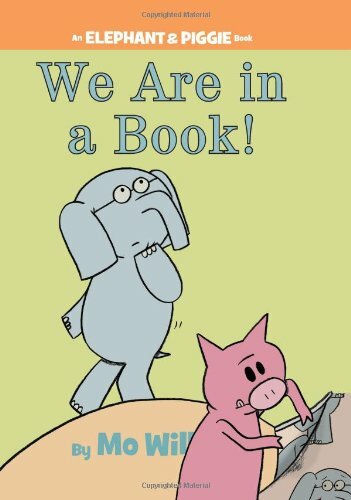 These books are great as early readers but they also have fabulous themes, short humorous text, and simple yet expressive drawings that work well for young children. I especially love that many of the themes focus on friendship and emotions. 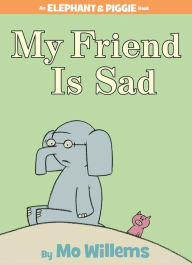 My Friend Is Sad shares the story of Piggie trying all kinds of ways to cheer up his friend Gerald the Elephant. In the end you realize that Gerald is most happy when he spends time with his best friend, Piggie. Reading this story is a wonderful way to begin a discussion about noticing other people’s feelings, feeling empathy for them and then thinking of ways to try to help them feel better. I’m sure you know how hard it is for children to waaaiiiiittttt for things. (Could you hear the whine as you read that?) In the book Waiting Is Not Easy! 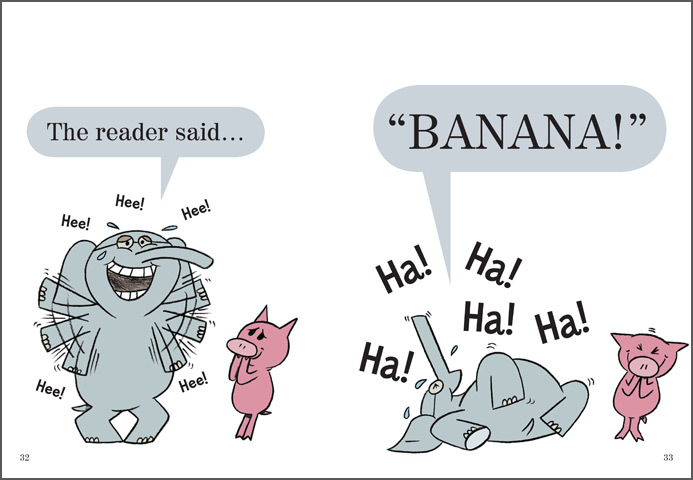 Piggie tells Gerald the Elephant he has a great surprise for him,but . . . . . Gerald will have to wait for it. 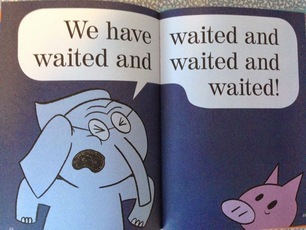 As the book progresses you watch Gerald become more and more distressed about waiting. This is a wonderful chance to talk about how frustrating it is to have to wait, about things you can do while waiting, and about other ways to handle our frustration. 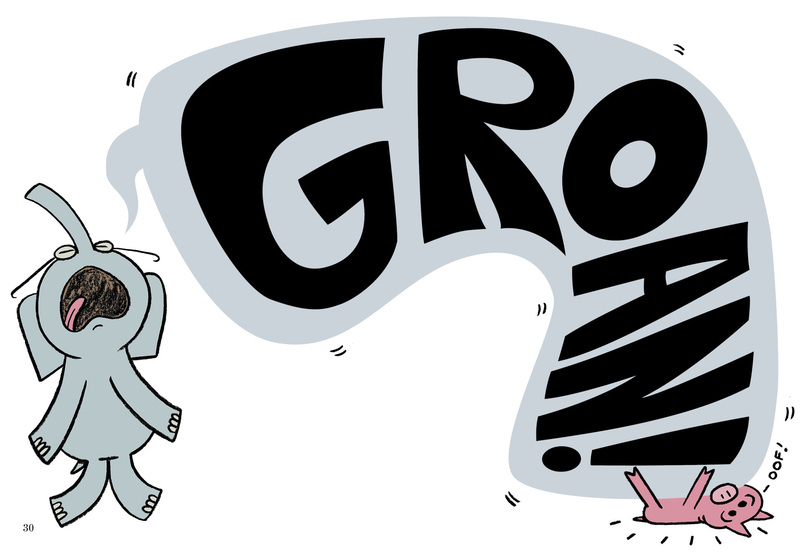 The picture with the big written word “groan” even visually shows how our actions and words affect others around us. The book ends with both friends enjoying Piggie’s surprise, the beautiful star-filled night sky. While many of these books deal with social themes, this one focuses the reader’s attention on books and words. 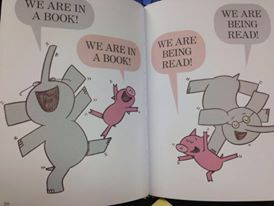 The two characters, Gerald and Piggie, realize they are in a book and that someone is reading it. I love how this makes us, as readers, see their actions differently. It’s like we are interacting directly with the characters. Later in the book the characters realize they can control what we, the readers, say. They have us say the funny word, “Banana!” Ha Ha. While it may not be the funniest word in the world they way the characters respond makes us laugh. This is a GREAT book for children just becoming interested in letters, words, and reading. I think you get the idea. These books are cute, fun and might just become your child’s favorites. They are also very reasonably priced. We ordered a few from Amazon with the cost just a little more than $6.00 each. We hope you’ll enjoy some time with Gerald and Piggie soon. We know our classes with throughout the year! 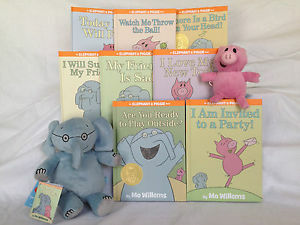 My kids LOVE Elephant and Piggie books! It’s about all Hayden wanted to read last year! And I love how he is so expressive when it reads it to me! Great books!